A navy blue tunic with white long sleeved shirt, navy tie and a pair of white socks. 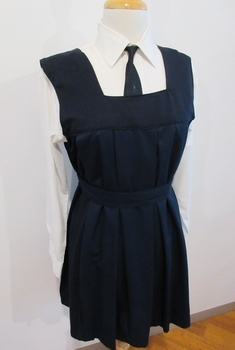 This is a replica of a school uniform worn by Joan Houston nee O'Brien when she attended St.Mary's Catholic School now known as Our Lady of Mt. Carmel Catholic School c. 1940's. She also wore it to the 1994 School reunion, 137th year of the school.